Sometimes even the best-intentioned jokes go awry. Over the weekend, enterprising Destiny 2 players figured out that a Monty Python-inspired emote allowed them to glitch through walls. 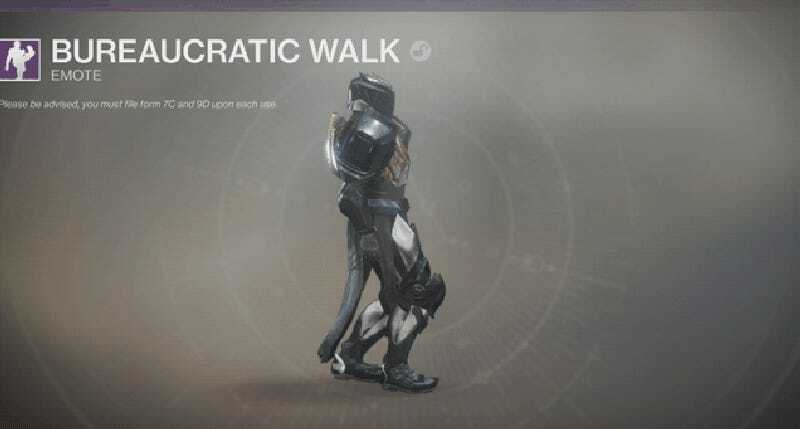 Bungie has since pulled the emote from the in-game store, though if you bought it, you can still use it. In Destiny 2, you can purchase emotes like dance moves, gestures, and pantomimes from the in-game Eververse, the game’s real-money microtransaction hub. Each week a selection of cosmetic items goes up for sale in exchange for Bright Dust, which is a sub-currency you get for breaking down unwanted Eververse items. 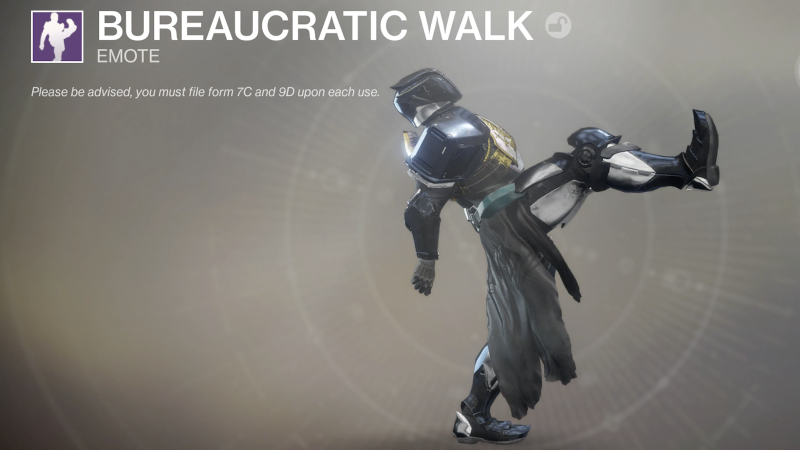 The emote in question is called “Bureaucratic Walk,” and it was evidently inspired by the classic Monty Python “Ministry of Silly Walks” bit. 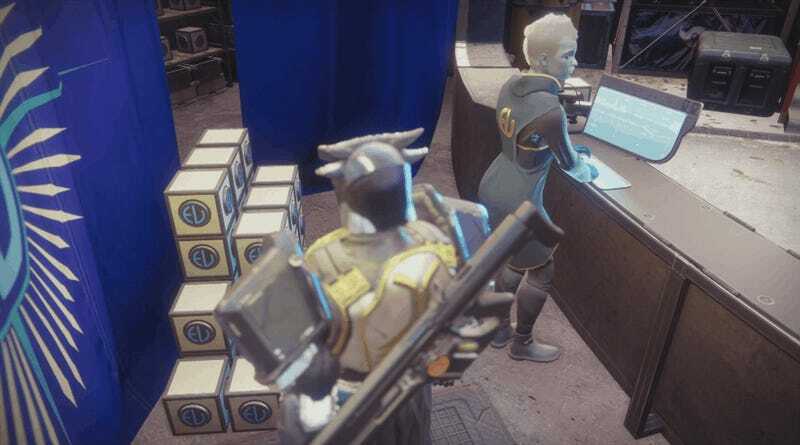 ...which is why you see me standing next to Eververse vendor Tess Everis in that screenshot. That’s normally impossible, but I glitched through the countertop. A bunch of people have been posting videos explaining how to use Bureaucratic Walk to pass through walls in the Tower, the Raid, and elsewhere. This one from YouTuber Djxyz0 lays it out pretty clearly. If you watch the emote in action, you’ll notice that my character does John Cleese’s signature high kick, then takes a shuffling step backwards. If you put your back up to a wall and begin the emote, your character will melt into that wall on their backstep. Hit “crouch” just then, and you’ll glitch into the wall. It’s a pretty silly bug that lets you access all sorts of places you aren’t supposed to go, though no sillier than some other glitches that have turned up in this still-new game. I’ve asked Bungie for clarification on what’s going on, though it seems like a safe bet the emote will either be adjusted or removed from the game and replaced with something else. In the meantime, those of us who picked it up last week are free to wall-glitch away. Monty Python would be proud.